No stranger to the audio world, Audio-Technica is a major player in today’s high-end consumer and professional market. Reaping in a well deserved Innovations Design and Engineering Award at this year’s 2010 Consumer Electronics Show (CES), Audio-Technica is spearheading the active noise cancelling market with the brand new ATH-ANC7b QuietPoint headphones. 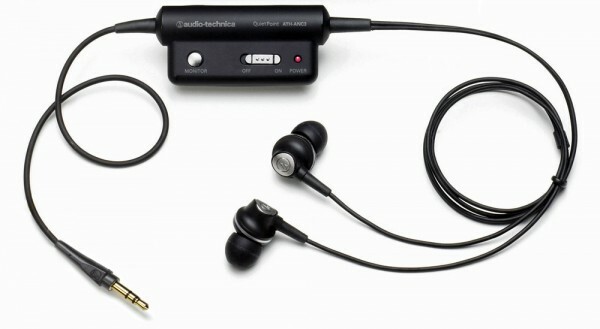 While Skatter Tech wasn’t able to acquire this award winner for review just yet, Audio-Technica did graciously provide us with their ATH-ANC3 active noise canceling earphones. If you’re thinking, “Earphones? Did you guys just settle for cheap, low-end, earphones?” While that might have been your initial thought, the sound that followed was quite impressive. The ATH-ANC3 comes packaged in a neat and professional looking box which displays the earphones and active noise control unit through a plastic window. The box advertises, “Up to 85% noise reduction (20dB) of background noise,” and displays a little diagram of how the active noise cancelling technology works. We know this product is for users who are always on the go, citing pictures of an airplane, commuter train, and office desk on the packaging. Moving into the packaging, we find a fair amount “extras” bundled with the earphones. 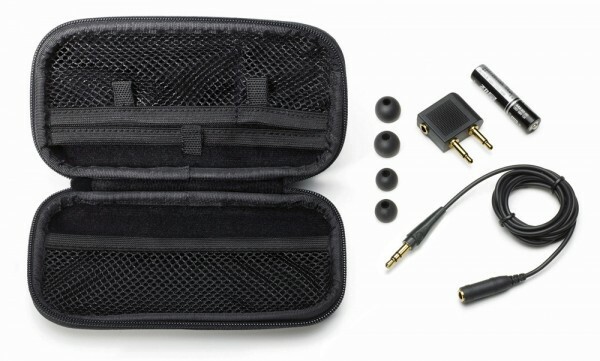 We were pleasantly surprised with Audio-Technica’s forethought into all the accessories. Included with the ATH-ANC3 earphones is a 1.6 foot long (.5 meter) extension cable, cleaning tool, airline adapter, soft rubber tips, AAA battery, and a rather large nylon carrying case to store all the included goods. The rubber tips are softer than the ones included with most earphones and came in small, medium, and large sizes to suit various ears. We found these very comfy and enjoyable. For those that like storing their audio player in a backpack or near the belt-line, the 1.6 foot long extension cable will prove helpful. To further protect your earphones, Audio-Technica includes pre-inserted filters at the openings of the sound canals. This helps prevent dirt and debris from getting in. Should something manage to get in, the cleaning tool helps remove any earwax that builds up over time; I guarantee that it will be handy. The airline adapter will take the two mono lines from the airplane and combine them into stereo sound for the ATH-ANC3 earphones. 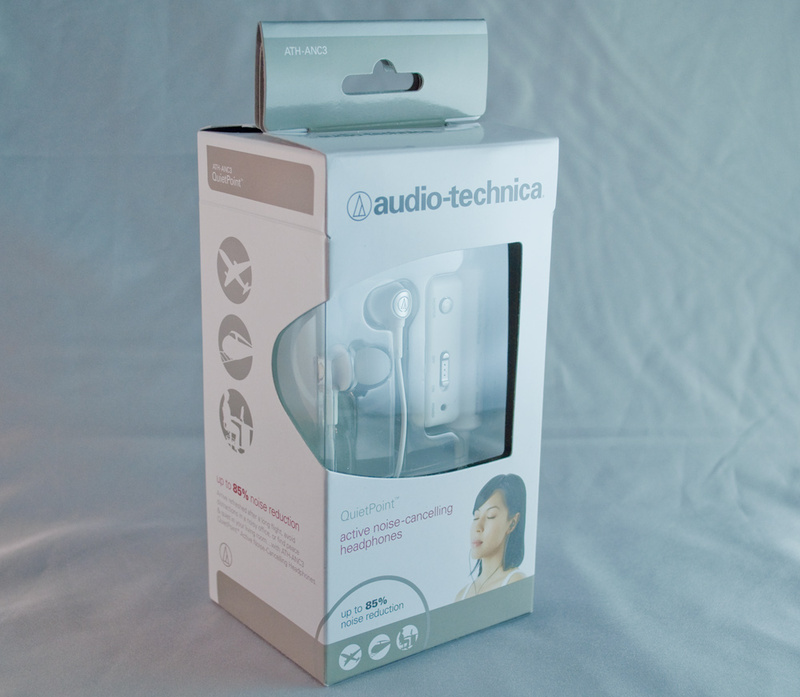 Audio-Technica even includes a AAA battery so you can start enjoying the active noise cancelling abilities as soon as you open the box. The nylon case has internal storage nets for accessory organization. We even found that it’s the perfect size to carry your iPod Touch in addition to the ATH-ANC3 earphones. 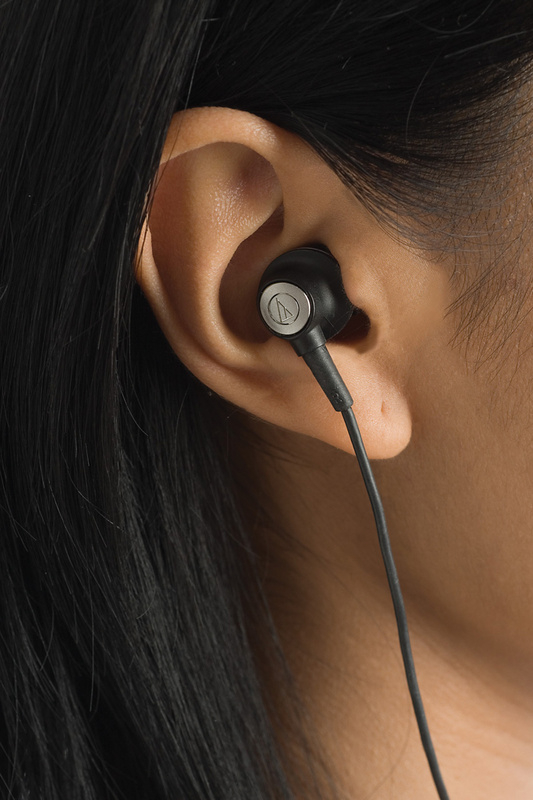 The main components consist of the ATH-ANC3 earphones mated to the active noise cancelling unit. Combined they total at 3.3 feet (1 meter) in length. Design-wise, these earphones are more of a “half in-ear-monitor.” Despite sitting in your ear canal, they are too shallow to earn the in-ear-monitor label. A clip behind the active noise cancelling unit helps distribute the weight since it houses the heavy AAA battery. There’s an “ON/OFF” slider to enable the active noise canceling feature and a “monitor” button, which temporarily disables it when held down, allowing you to hear your surroundings. The wire is soft and flexible, but was thankfully robust. All of the plastics seemed durable and suited to last for years. Based on previous encounters with earphones, we weren’t expecting a lot coming from active noise canceling devices. However, we were truly impressed with the ATH-ANC3’s performance. While active noise cancelling has been known to slightly degrade audio quality, the difference was barely noticeable due to Audio-Technica’s excellent implementation. We instantly noticed that the highs had definition and articulation which earphones and smaller headphones generally lack. Cymbals were crisp and clear to the point where we thought for ourselves, “Why can’t all earphones do this?” Needless to say, the highs were very enjoyable, despite being slightly recessed. With the good highs coming from the ATH-ANC3s, we were also glad to hear quality bass. Being a high-end professional audio company, Audio-Technica knows the innate importance of a well balanced sound. That’s just the impression we were left with listening to the low-end of the ATH-ANC3s. The bass had a good depth, a nicely punchy articulation, and the perfect amount of synergy with the mid and high range. It was quite pleasing to hear a quality bass that wasn’t over emphasized by any means. If we could change one thing, we would have preferred slightly more impact in the bass. Feeling the “thud” and beat of the music enhances the experience. That doesn’t by any way mean the volume or intensity of the bass, but rather the actual physical kick that you feel running through you. The sweet spot for these earphones came in the midrange. To be exact, the lower midrange. Male voices and lower midrange instruments came through beautifully. They gave off a rich sound filled with passion. While rich, the sound wasn’t altered by feeling colored or warm, yet you could tell it had been well tuned. Moving a little higher, the upper midrange was the only area where these earphones didn’t impress us. High female voices tended to get a bit harsh during climaxes in the music and didn’t have as rich of a sound as male voices. We also found them to feel slightly veiled and airy as if they could have used a bit more substance and prominence. Even with these shortfalls, the upper midrange maintained the rest of the sounds’ separation and articulation. 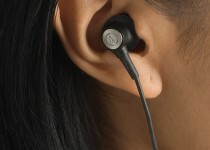 Overall, the ATH-ANC3 earphones carry on a great Audio-Technica house sound. The overall experience is neutral, yet not boring or tediously analytical. There’s no major emphasis on any region of the frequency range and this lends to a very balanced and well-rounded sound. Being earphones, these don’t have a stellar sound stage. However, as we’ve been consistently saying, these are definitely better than most earphones. Seeing as the active noise cancelling unit is one of the primary features of the ATH-ANC3s, we thought we might elaborate on it a bit. With the one AAA battery that Audio-Technica provides, the active noise cancelling unit is still reasonably light and shouldn’t be an issue for those that don’t like extra baggage. 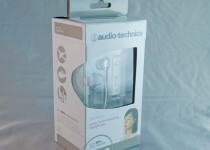 On the box, Audio-Technica claims up to 85% of noise reduction. Listening to the these on the plane ride back from CES in Las Vegas, we can say that Audio-Technica’s figures sound pretty accurate. Unfortunately, while not listening to music, the attenuated sound of voices is still easily distinguishable. Passively, we estimate around 5-10dB of isolation, which isn’t much. If you are looking for complete passive attenuation, grab a full in-ear-monitor. Without music playing, we found that the active noise canceling gave everything an underwater feel. When trying to drown out ambient noise, the result leaves you feeling as though you are wearing a full fishbowl over your head. 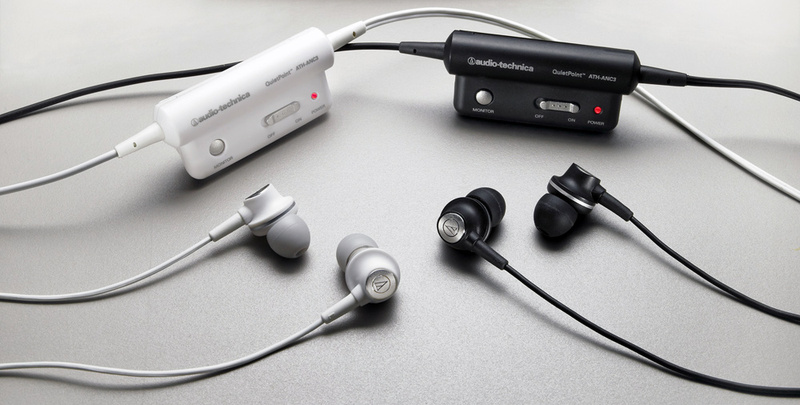 The AudioTechnica ATH-ANC3 QuietPoint Earphones are a strong player in the active noise cancelling earphone market. With an MSRP of $169.95, the price may seem a bit high, but street price seems to hover around $60 on Amazon.com. At this price the ATH-ANC3s are quite a good deal and easily earn Skatter Tech’s recommendation. Although intended for commuters or frequent fliers, these earphones will serve equally well in a home setting. The ATH-ANC3’s excellent performance has gotten us excited to get our hands on the brand new ATH-ANC7b headphones we saw at CES.